ESPN debate man/screamer Stephen A. Smith has made some comments lately that suggest he doesn’t follow the NFL all that closely. And following the NFL closely is hardly a big thing in life, except when your job is literally to analyze it/yell about it for hours every week. In December, Smith said he was looking forward to the Hunter Henry vs. Derrick Johnson matchup in a Chiefs-Chargers game. Small problem there: Henry was on injured reserve and played zero games for the Chargers in 2018, and Johnson was a free agent that played zero games for the Chiefs in 2018. And last week, Smith “just forgot” about Drew Brees when making his list for the best quarterbacks in this year’s NFL playoffs. That’s the same Drew Brees that led the NFL in passer rating (115.7) this season, and led the Saints to (being tied for) the best record in the NFL. Oh, and Brees became the NFL’s all-time passing leader this season. Easy mistake. 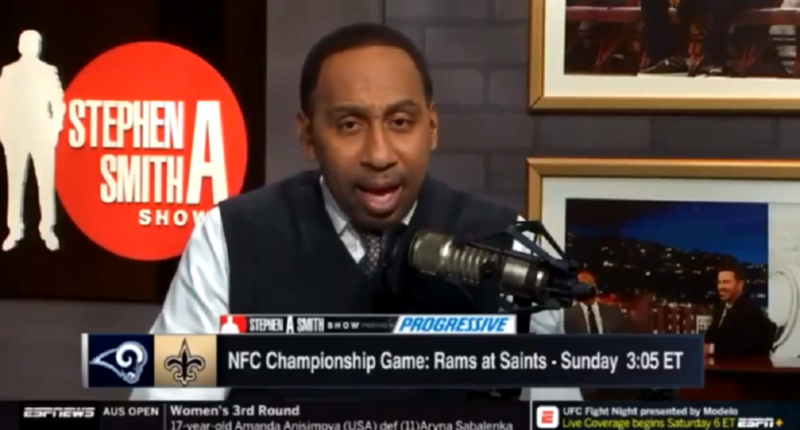 Well, on Friday’s edition of the Stephen A. Smith Show, Smith talked about New Orleans running back Kareem Hunt ahead of Sunday’s Saints-Rams NFC Championship game. But, uh, Hunt doesn’t play for the Saints. In fact, Hunt currently is not on *any* NFL roster (and likely won’t be anytime soon) after the Chiefs cut him in November following disturbing video emerging of him getting into a physical altercation with a 19-year-old woman. Smith obviously meant Saints running back Alvin Kamara here, but that’s a brutal and very random blunder. If you want us to take the debate banter even semi-seriously, you can’t keeping making mistakes like this.